A male and female youth and two younger boys stand together to be photographed at a cattle camp, with a windbreak behind them. 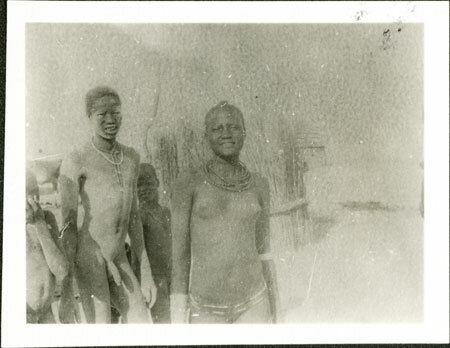 This image is part of a film that includes images of Nuer Lou cattle camps, and so probably dates to 1931 when Evans-Pritchard did the bulk of his research among the Lou, especially at camps on the Sobat River. Note on print reverse ms pencil - "2 107 "
Morton, Chris. "Portrait of Nuer youths" Southern Sudan Project (in development). 03 Jan. 2006. Pitt Rivers Museum. <http://southernsudan.prm.ox.ac.uk/details/1998.346.107.2/>.